The costs of handling and removing pest problems can be quite expensive. One of the biggest problem with pests is what they do while living on a roof and what they leave behind to clean up. Depending on the type of roof, preventing and removing a pest problem can be anywhere between simple to complex enough to call professionals for help. If you have pests on your roof call us at 817 381 6855. 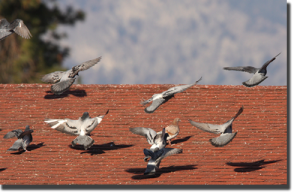 All kinds of animals can leave behind undesired effects to a roof. Squirrels and birds are notorious for building nests or temporary resting places, leaving behind dirt, leaves and debris as building materials. If these animal structures are not cleaned off they can lead to mildew, rot and damaged shingles..
A common roof pest is bees, wasps and hornets. Often these insects will nest inside the roof or along the roof lines inside the siding, undetectable to the eye. In the winter months, these insects will hibernate inside these areas and wait for warmer weather to begin building their nests along the crevasses of the roof lines. While bees and wasps aren’t inherently damaging to one’s roof they do bring undesired effects of swarming, defensive and attack behavior to humans who enter their space and can quickly double in numbers.